Potato Fry | Simple and Delicious ! Chop potatoes as thin round slices. Make a batter (thickness of idli batter) by adding water slowly into Gram flour. Mix very well to avoid lumps. Dip the chips one by one in this then deep fry. Fry five or six pieces together. Looks like pazhampori..Its really nice,you mean the thickness of Idli batter?I am sure that kids will love this.Thanks for sharing. Hey, I make this one too!! simple and fast snack, isn't it? We call them Bondas and my kids love them to munch on! :))Looks puffy and yummy! Delicious and unusual way to serve potatoes! I have some gram flour that I've only used once so now I have two recipes for it! 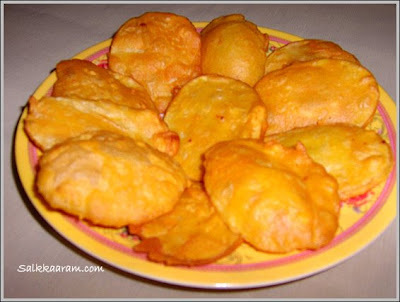 We call them as Aloo Bajji, I too make them often. Its great and easy snack. Looks great. Yeah, thickness of idli batter..surely kids will love it..
Asha, we also have bonda with potato, but not this one! will blog it later..
Praju, ethu chayakku pattiyathu thanne..try it..
welcome to you and thanks for visiting..this is really very simple recipe..if you find the easiness once, you will make it often. This sounds like it would be a guilty pleasure. Looks delicious! picture looks tempting.. I use onions too for this. i also make similar ones, but they never look so puffed up and crunchy! i add a little bit of hing also. thanks for the suggestion, next time I will add hing..Keep visiting..
very tasty and crunchy snack! !